The district administration has instituted an inquiry into the ownership controversy of a vacant land, which has become a bone of contention between players of Gandhi Ground and Guru Nanak Dev Stadium. The border area farmers yesterday demanded compensation package of Rs 5,000 per acre for those farmers whose agricultural land fall beyond the wire fencing installed on the border of India and Pakistan. About 42 per cent students of Nishkam Sewa Public School, a school for underprivileged and ragpickers, were found to be anaemic during a medical check-up camp organised by Rotary Club Amritsar Central. The work of restoration of historical gates in Amritsar has been expedited to meet the deadline of April 2011. Lodging their protest against the indifferent attitude of the state government towards their demands, employees of the Punjab State Power Corporation Limited held a rally here. Dr Hardyal Singh Gharyala, Deputy Director, Horticulture Department, has advised the farmers against excessive use of fertilisers and insecticides. Seeking salaries as per the Minimum Wages Act, 1948, the anganwari workers have decided to launch an agitation if the government failed to pass the resolution of providing minimum wages to them in the coming budget session. City multiplexes are turning to satellite towns and other districts to get prospective customers. The city has two state-of-the-art malls with multiplexes. The Rural Veterinary Officers (RVOs) from Amritsar and Tarn Taran today decided to approach all the members of Parliament and MLAs of Punjab through letters for regularisation of their jobs. The Amritsar Municipal Corporation (AMC) has got FIRs registered against individuals and firms, who have pasted advertisements on government property illegally. The Kisan Sangarash Committee (KSC), Punjab, has taken a serious note of closing down of certain Powercom sub-division offices in the area and has decided to launch an agitation to lodge protest against the move of the corporation. 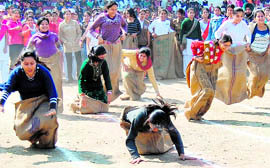 Sports day was held at the BBK DAV College for Women, here. The programme began with welcoming the chief guest, Kahan Singh Pannu, Deputy Commissioner. Ravneet of BCA-I grabbed the first place during the sack race (heat) event. The second and third places were bagged by Manmeet (BA-III) and Kuljeet (BBA-II), respectively. Musical giants T.N. Majumdar (sarod) and Akram Khan (tabla) regaled the staff and students of Spring Dale Senior School with their performance. On the eve of the third heritage festival on Thursday, a play Khande De Dhar, directed by Mandeep Kaur was staged at Preet Nagar (locality of love and friendship), which was used to be the hub of renowned Punjabi, Hindi and Urdu writers and artistes during the pre-Partition days. Gulpinder Singh, his father Kulbir Singh and mother Jaswinder Kaur of Gaunsabal village (Amritsar) have been booked for demanding dowry. Deputy Commissioner K.S. Pannu said SDM-I Sandeep Rishi had been asked to identify the owner of the land and the same would be restored to the rightful owner. Gandhi Ground is a venue for cricket while Guru Nanak Dev Stadium is used by hockey, athletics and weightlifting players. In order to augment facilities at Gandhi Ground, its administrative body, Amritsar Games Association (AGA), whose president is the Deputy Commissioner, initiated demolition of the wall on the vacant ground yesterday. It prompted the players and coaches, who practice at Guru Nanak Stadium, to protest against the move. They stopped the demolition of the wall. Former national hockey player Balbir Singh Randhawa claimed that the wall was raised by the Sports Department two years ago. He said players had urged the government to raise a multipurpose gymnasium hall. He said at present weightlifting players had to practice under a cramped room made under the steps of the stadium. He added that exercise schedule of these players was severely affected during summers. It is learnt that the AGA wants to construct a cricket academy of an international standard. This was the major demand, among others, raised by the farmers, who rued that they got scant time periods for tilling their land across the fencing, apparently, due to security reasons, during a rally organised at Attari Power House by farmers hailing from at least 20 villages bordering Pakistan. There is about 30,000 acre of agricultural land located across the fencing. The farmers emphasised that special food stock depots should be set up at the border villages for providing subsidised food items, keeping in mind the escalating cost of essential commodities. Dr Jagroop Singh Sekhon, former head of the department of political wing at Guru Nanak Dev University, while addressing the farmers said several recommendations for their welfare had been made to the state as well as Centre Government after conducting a study on their plight as per the UGC programme, but the corruption and harassment prevailing in the government departments prevented these recommendations from getting implemented. Farmers’ union activist Rattan Singh Randhawa, while lamenting the problems being faced by the farmers, emphasised that the recommendations of the Dr Swaminathan Committee should be implemented unconditionally, which included minimum support price for the produce, comprehensive insurance of the crop at government rates, compensation of at least Rs 25,000 per acre in case the crop gets destroyed due to unavoidable weather conditions and subsidies for purchasing seeds. He also demanded an additional bonus of Rs 200 per quintal. “It is pity that despite tall claims by the state as well as Centre Government, the farmers could not get MSP, as fixed by the Dr Swaminathan Committee’s recommendations. The farmers have not been getting the minimum price of Rs 1,495 per quintal of paddy. The raise of just 2 per cent in the wheat price is negligible in comparison to manifold increase in the cost of production,” he said. Dr Naresh Grover, a prominent paediatrician of the city, who also runs a private hospital here, and his team of doctors, including Dr Rupinder Jaswal and Dr Rohit Thakur, examined about 150 children of the school in the camp during which free blood and clinical tests were also conducted. “In the clinical reports, about 42 per cent children were found anaemic besides having a kind of behavioural disorder known as Pica in which the affected persons have tendency to eat soil, paper or rubber etc,” said Dr Grover. He said 50 per cent of children where suffering from abdomen pain due to work infestation while 30 per cent were having cough and cold. Free medicines were also distributed to them. Speaking to the children, he advised them to take bath daily, cut their nails and maintain cleanliness. He said the main reason behind their being anaemic is deficiency of iron in their diet besides worm infestation. The environment in which they live also contributes to various diseases. He said in association with the rotary club, his team of doctors would revisit the school within next two months to re-examine the students. Being run by FCI retired employee Sardara Singh, Nishkam Sewa Public School is doing yeoman services in educating poor kids of ragpickers and try to bring change in their lives. The school, which was earlier being run in temporary shed, recently got a building in the old civil surgeon office with an active role of the district administration. Earlier, the camp was organised by past assistant governor of the club Rakesh Kapoor. S.S. Virk, president of the club, was also present during the camp. The district administration had taken the task of restoring the historical gates, which were constructed during the Maharaja Ranjit Singh’s time and were later demolished or damaged with the passage of time, to their lost glory. In the first phase, six heritage gates --- Lahori Gate, Hakiman Gate, Hathi Gate, Gandhi Gate, Khazana Gate and Sultanwind Gate --- that fall in the walled city of Amritsar, were to be restored by the conservation experts. K.S. Pannu, Deputy Commissioner, Amritsar, while reviewing the work of restoration of these gates with the construction company officials and the consultants executing the work at site, said Rs 56.12 lakh was being spent for the restoration of the gates. The work of restoration, which was started in the month of May 2010, is likely to be completed by April 2011. In addition to the works at six gates, the historic Ram Bagh Gate, which is the biggest of all has already been conserved and restored by the state government with a cost of Rs 40 lakh. The employees, under the banner of Technical Services Union, resented that after the unbundling of electricity board into a corporation and adoption of the Electricity Act, 2003, their service security and benefits have been compromised. Addressing the farmers during a training camp, organised at Assal Uttar village under ATMA scheme here today, Dr Gharyala also advised the farmers to bring more area under horticulture as the government was granting subsidies under the scheme to plant fruit trees. Dr Gharyala said adopt natural system of agriculture as the excess use of fertilisers and insecticides had polluted air and groundwater. Dejected over the continuous indifferent attitude of the state as well as the central government towards their demand, they threatened to demonstrate in front of Parliament on February 24 after holding a march from Ram Lila Ground in Delhi to press their demands. They had also decided to participate in the protest march announced by all the trade unions of the country on February 23. The trade unions have declared to protest against the government’s failure to control corruption and rising inflation in the country. “Whenever we approached the Chief Minister, he passed the buck while expressing inability and asked us to see the central government authorities in this regard, which also failed to address the problem. We are working 12 to 14 hours a day and providing services in almost every government sector, against the meagre salary of Rs 2,300 per month which is not even at par with third and fourth class government employees,” said Saroj Chhapri Wala, president of All-India Anganwari Workers Helpers Union. The third and fourth class government employees receive Rs 7,810 and Rs 6,200, respectively, besides other benefits. At least the government should initiate steps to provide minimum wages to us as per the Minimum Wages Act 1948, she said. “Even the unskilled worker is getting Rs 3,800 while a skilled worker is getting Rs 4,800 per month,” Chhapriwala pointed out while adding that the Goa and Tamil Nadu governments were giving more than Rs 5,000 to its anganwari workers. She said the government should also provide them pucca anganwari centres besides making arrangements for gas and kitchen for cooking meal for children and books. She said the union had submitted their memorandum to Chandresh Kumar, chairperson of the committee formed by the state government to look into their grievances. We would not allow the government to backtrack from their own laws and policies, she said. She said the union would move to the court if the government failed to implement minimum wages in their cases. Head-Exhibition, Cinepolis, Ashish Shukla, said all kind of efforts, including promotional events, subsidised tickets and advertisements, were being carried out in satellite towns, major sub-divisions and nearby districts to woo customers. Cinepolis is running a multiplex in Celebration Mall here. He said these towns were Ajnala, Majitha, Batala and Gurdaspur. He said schemes like ‘buy one get one free’ was introduced for the residents of these areas. Besides, rates of the shows like Rs 80, Rs 100 and Rs 150 were introduced so that the interested viewers could adjust their schedule as per their budget. Shukla said the multiplex consciously show Punjabi movies. “My 13-year-old daughter Kirat and nine-year old son Jasmeet love to visit these malls,” he added. Prodipta Sen, VP, Marketing, Corporate Affairs and Retail, Alpha G Corp, said outdoor activities like advertisement through hoarding and local radios were being carried out to attract customers from the rural belt. He said his company was publishing its own tabloid which included articles in Punjabi apart from English to connect with locals. This tabloid are distributed free of cost in adjoining towns. He claimed that the mall was attracting rural folk, especially those whose near and dear ones were settled in foreign countries. “We would write to 13 members of Parliament from Punjab and 117 MLAs to inform them about the exploitation we are undergoing,” said Dr Navdeep Singh Khinda, state president of the Rural Veterinary Officers Association. There had been 434 RVOs working under zila parishads on contract basis for four and a half years working on meagre salaries, even less than regular class IV employees of the Punjab Government. The association had been fighting for the regularisation of their jobs and its representatives had met the Chief Minister, Deputy Chief Minister, Cabinet Minister Ranjit Singh Brahmpura and other high-rank officials in this regard. “However, there is a cold-shouldered response to our demand till now as they only gave assurances and nothing has been done to fulfil them,” said Dr Gagandeep Singh Dhillon, spokesman for the association. “We will start posting the letters from today onwards and we are starting from Amritsar. We will be posting letters from all the districts of Punjab daily till the coming Budget Session of the Punjab Assembly, so that they can raise our issue in the Assembly,” he said. However, Khinda threatened that if the government failed to pay heed to their demand, the association, which till now was resorting to peaceful protests, would intensify the agitation. In the first phase, the AMC commenced this drive from the elevated road bridge. As many as 10 individuals or firms who have pasted their advertisements on the pillars of elevated road bridge have been booked with the Maqboolpura police station. The KSC organised a meeting of its Agara Pichhara and Manochahal Kalan zones, presided over by Nirvair Singh Dalake, a leader of the organisation, at Jhamke village, 20 kms from here. The KSC called it an anti-farmer decision. “The farmers now have to go faraway places to lodge their grievances regarding power supply etc,” it said. The KSC would hold a dharna at Manochahal Kalan on February 28. The agitation would be intensified in case the Powercom management failed to open the offices. Shifali (BD-II) stood first in 50-m race (heats and final), whereas Jatinder (BSc non-medical) and Baljinder Kaur got second and third places, respectively. Harpreet, Karishma and Sapna occupied first three positions in the one-leg race. Arshiya, Gurpreet and Navneet were declared winners in the chatti race. Principal Dr Neelam Kamra highlighted the achievements of the college in sports. The closing ceremony commenced with prize distribution in the presence of chief guest Mayor Shwait Malik and guest of honour Dr Kanwaljit Singh, Director, Sports, GND University. As many as 16 poets from various parts of the country today participated in a national programme on poetry organised by the Hindi Department of DAV College under the UGC’s College with Potential for Excellence Scheme on the college campus. Noted poets Liladhar from Uttarakhand, Manglesh Dabral from New Delhi and Nikhil Giri from Uttar Pradesh also took part. Dr K.N. Kaul, Principal of the college, welcomed the participants and apprised the participants of the achievements of the college. Students of Khalsa College grabbed the first and third positions in the M.Sc chemistry IIIrd semester examination of GND University. Kritika Kohli of Khalsa College stood first in the university by securing 1077/1300 (82.85 per cent) marks and Manpreet Kaur stood third by scoring 1018/1300 (78.3 per cent) marks. Meanwhile, all the 19 students of Khalsa College got the first division. The Global Institute of Management gave cash prize of Rs 50,000 each to university toppers at the the freshers’ fest held here. 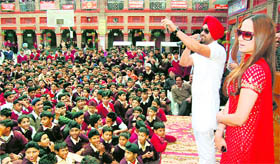 held at Ropar where a large number students from Punjab, Haryana and Himachal Pradesh participated. Gulzar Singh Ranike, Minister for Animal Husbandry, Punjab, urged the institute to adopt poor deserving students so they could also get admission in professional colleges. Balram Ji Tandon said the students should the motivated to participate in the development of the country. Earlier, Gurpreet Walia of the management stream was declared “Miss Fresher”, Gurvinder Singh from the MCA course was declared “Mr Fresher”. The event was organised under the aegis of Society for Promotion of Indian Classical Music and Culture Amongst Youth (SPICMACAY) today. The duo also interacted with the students and discussed traditions and nuances of classical music. Rajiv Kumar Sharma, principal, Spring Dale Senior School, who is also the coordinator of SPICMACAY, said seeing two accomplished musicians perform together was a refreshing experience for both the staff and students. “Our aim is to enable students to appreciate classical music and the people associated with it to bring them closer to their heritage,” he said. Majumdar’s repertoire combined elements from the Dhrupad, Tantrakari and Gayaki styles of music. Like most other classical musicians, he started learning music at an early age, first with his grandfather Bibhuti Ranjan Majumdar and later with his father Ranjan Majumdar. He also received vocal training from Amaresh Chowdhury and rhythm training from Anil Palit. His major breakthrough as a student came when he was taken under the guidance of Ustad Bahadur Khan, with whom he studied for 18 years.After the demise of Ustad Bahadur Khan, Majumdar studied under Ajay Sinha Roy. Later, Ustad Ali Akbar Khan accepted him as a disciple. Akram Khan belongs to Ajrara Gharana. The Ajrara Gharana style includes bol-patterns that are rather complicated, with barabar and ad laya form the bulk of tempo repertoire. Akram Khan is arguably the finest contemporary performer of this style.He received his initial training in music from Late Ustad Niazu Khan who was famous for his technical style and guidance. He is also fortunate to have learnt from his great grandfather Ustad Mohd Shafi Khan. He continues his riyas and training under the guidance of his father Ustad Hashmat Ali Khan. He has also undergone formal training at the Prayag Sangeet Samiti, Allahabad, and passed the Sangeet Praveen (Master of Music) from there, apart from Sangeet Visharad at Chandigarh. The play depicted the struggle of a young educated girl in the modern social setup. Another play Agni Prikhiya was held at Mahilanwala village near here where a folk programme was also organised by famous folk artist Harinder Sohal, who rendered traditional touch to the programme by belting out Mahia, Heer, Tappe and traditional Boliyan. The third edition of annual heritage festival is being organised by Virsa Vihar Society. The festival would be formally inaugurated by Deputy Commissioner Kahan Singh Pannu from historic Ram Bagh (Company Bagh) by launching a heritage walk. In her complaint to the police, Gulpinder’s wife Dr Poonam Kaur Gill alleged the trio harassed her for dowry since the marriage. They have been booked under Sections 498A and 406 of the IPC. Poonam was living with her parents in Nagoke village, 30 kilometers from here.